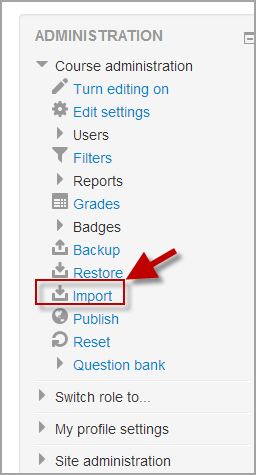 Before you can import activities from an MPCC course into your own Moodle course, you need to a have copy of the course restored onto your Moodle site. Contact your Moodle admin to have them restore a backup copy of an MPCC course to your Moodle site. Select the MPCC course that has the activity you wish to import from (see the note above about adding MPCC courses to your site) and click Continue. You will be presented with the “Backup Settings” page. Check Include Activities. Select the activities you want to import into your course (note: in order to select an activity, you need to select it’s parent topic first). The confirmation page will place green check marks and red marks next to the backup settings and include item list for you to review. You should see “Import complete. Click continue to return to the course.” message, or an error message indicating that the import process did not take place. Adapted from the Import Course Data Moodle doc.